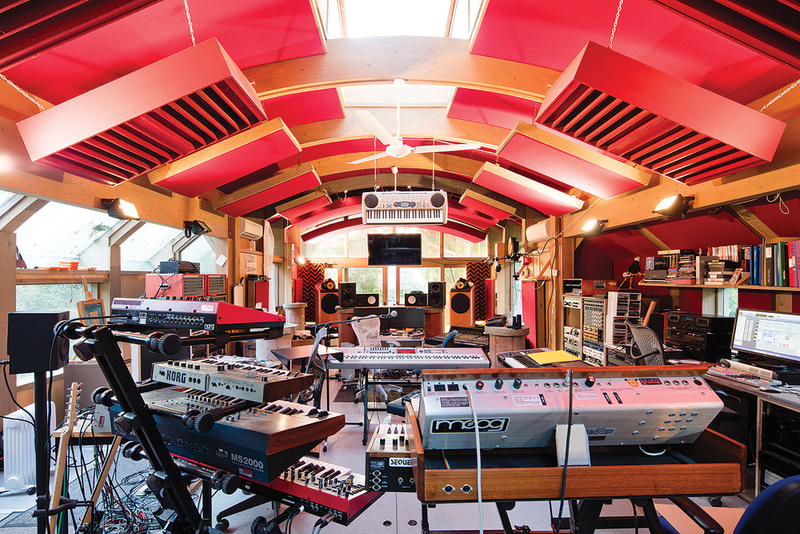 The Big Room at Real World represents a radical rethink of how a large-scale recording studio can be organised. The Big Room is housed in a huge glass extension to the main mill building.The English county of Wiltshire is home to many sites of historical importance, including the stone circles of Stonehenge and Avebury. 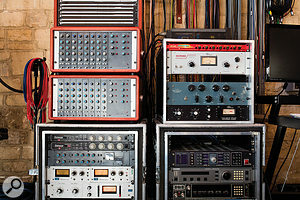 Less ancient, but of much larger significance to the global recording community, is Real World Studios. When Peter Gabriel left Genesis, the singer, songwriter and record producer built a studio in a cowshed in the Swainswick Valley, before the global success of his 1986 album So gave him the resources to construct a more ambitious facility. Wanting it to be in the same area, and near running water, Gabriel settled on an old watermill near the village of Box. The 13-acre site housed a number of buildings, some dating back to the late 18th Century. The main house was built around 1820; used as a sawmill and semolina factory until the 1950s, it was also home to a girls’ school before being converted into offices and storage space. The main construction phase took place between 1986 and the end of 1988, overseen jointly by the studio team and architects Feilden Clegg Design, Buro Happold, Dave Bell and Neil Grant. During construction, the central mill building was underpinned and put on new foundations in order to support all the concrete that had to be poured in for acoustic isolation. Elaborate acoustic treatment in the Big Room. 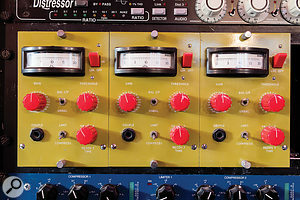 Numerous Neve channels of different types add to the channel count of the Big Room’s SSL 9000K.The first studio room to be completed is no longer used in that role, but serves as offices for Peter Gabriel’s publishing outfit WOMAD. 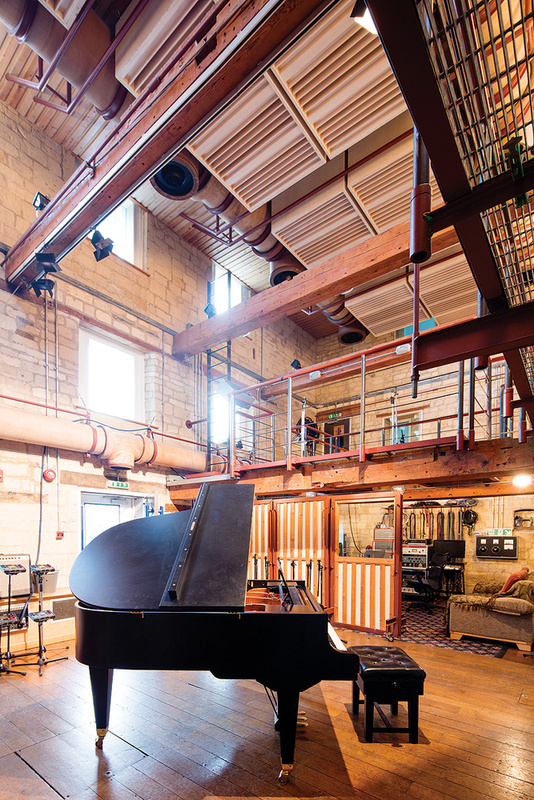 However, the space that put Real World on the map as a groundbreaking and thoroughly unconventional recording studio was the Big Room, completed in the final construction stage and prompted by Peter Gabriel’s dissatisfaction with traditional dark, isolated studio environments. The life-giving elements light, air and water are incorporated in all the active rooms at Real World, and most of all in the Big Room, which, from the outside, resembles a vessel from outer space. Its large window overlooks a pond that was dug out as an extension of the millstream during construction, providing ample natural light and a scenic, tranquil view. A constant stream of fresh air is provided by way of air-conditioning ducts made of natural materials that add to the organic feel of the space. The Wood Room is another large, open-plan space with lots of natural light.Operationally, one of Peter Gabriel’s primary goals has always been communication. 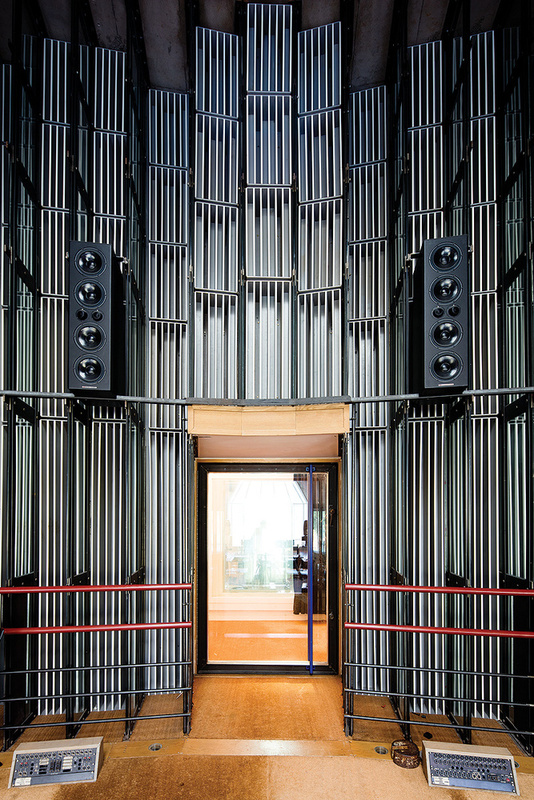 His projects bring together musicians from a wide range of backgrounds, and the architecture of the studio reflects this. The vast open room offers a floor space of 185 square metres, spanning a stunning 15 metres from the rear wall to the front window. 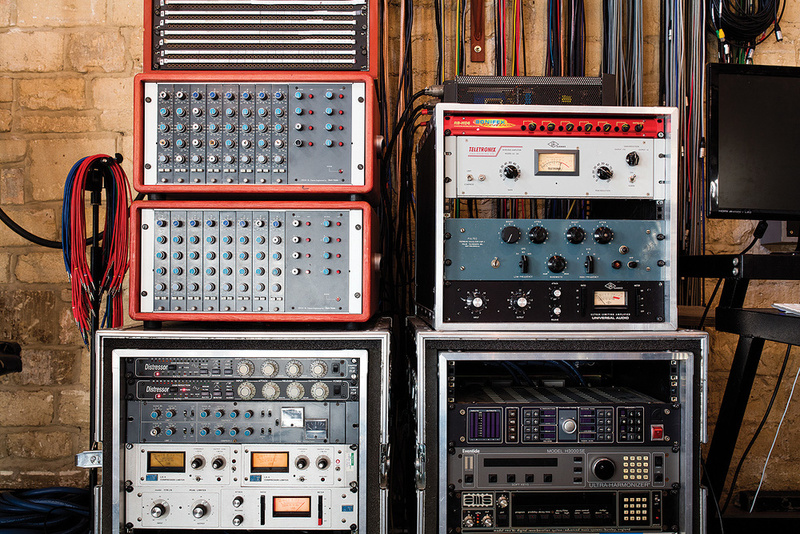 Although there’s a separate machine room and two isolation booths, there is no separation between live and control areas, and no physical barriers between performing musicians and the recording staff. Interestingly, the custom wrap-around SSL 9000K console with 72 inputs faces towards the front window, not the stage-like platform at the rear of the room where most ensembles would set up their kit. During the decades many different studio spaces have been constructed in the Real World compound, but not all of them remain active. Today, the second notable recording area is the Wood Room: with a floor space of 110 square metres, this is also a large facility. It can be booked in conjunction with the Big Room and also as an independent space, for there are tie lines throughout the building. 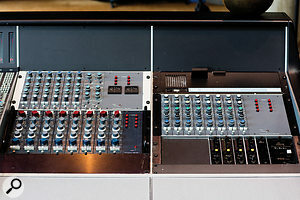 Also conceived as an open-plan space, it is equipped with a 24-channel SSL AWS console accompanied by 16 Neve 33114 preamps. The Wood Room boasts a spacious isolation booth as well as a mezzanine level, and feels even larger than it actually is, due to its impressive ceiling height. 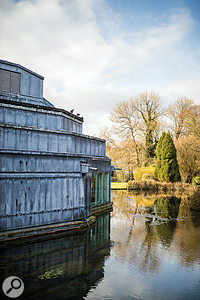 Peter Gabriel’s well-equipped writing room occupies a separate building on the other side of the mill pond. 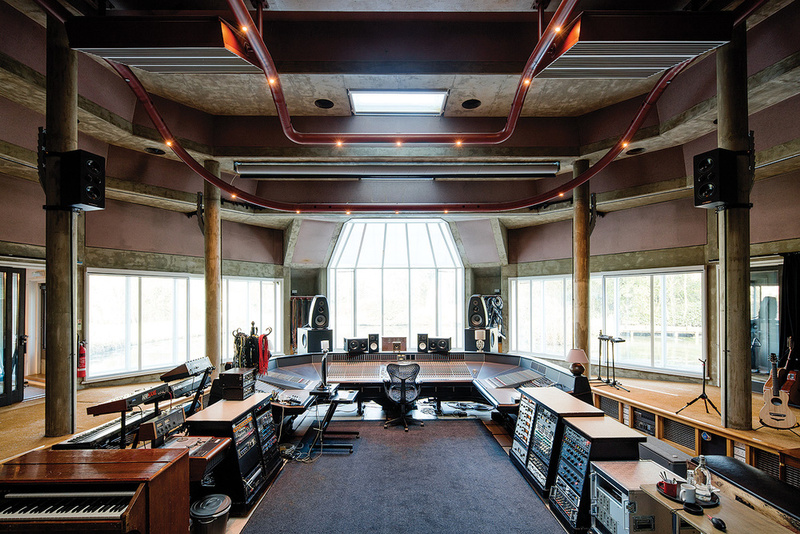 The control area of the Wood Room boasts 16 Neve 33114 channels, in addition to the SSL AWS desk.The Real World site is also home to Peter Gabriel’s own private writing room in a wooden structure on the opposite side of the pond, a space primarily conceived as a yoga retreat, along with post-production and Foley facilities, a rehearsal studio, and numerous smaller studio spaces rented out to external producers. Real World is a residential studio, which offers six double bedrooms and also another detached cottage for more privacy, and there is even a full-time chef on site. 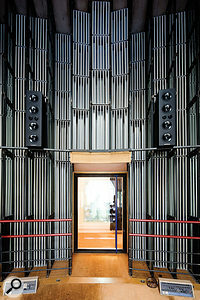 The premises also host Peter Gabriel’s numerous business operations, which include Real World Records and WOMAD. 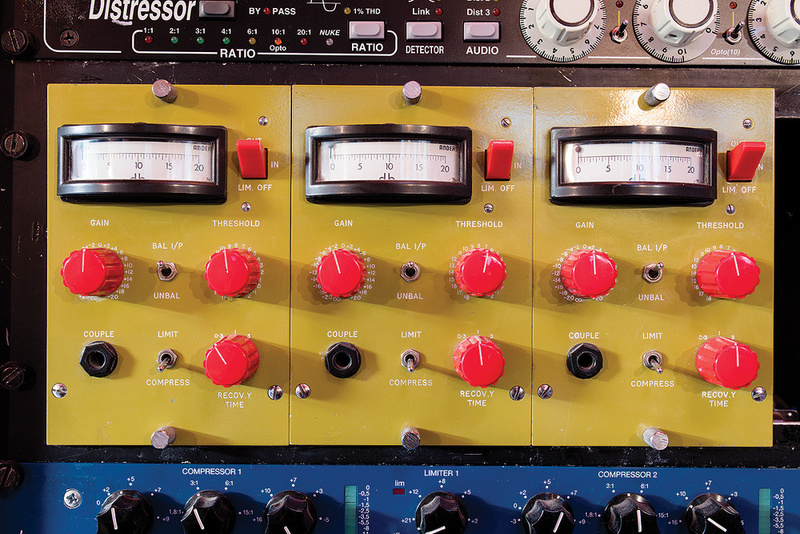 These Decca limiters have survived from the desk in Peter Gabriel’s first studio in a cowshed nearby.Traditionally, Real World Records has been the largest client of the studios, but they have also played host to a huge range of other acts. The studios host songwriting camps on a regular basis, and when Kanye West booked Real World, he did a similar thing, with more than a dozen independent workstations all spread across the Big Room. Notable clients over the years have included Björk, Seal, Amy Winehouse, Beyoncé, Daniel Lanois, King Crimson and New Order, and recent bookings have included Guy Garvey, Van Morrison, Marillion, the Gloaming, Nick Mulvey, and the Vamps. And if this all wasn’t enough, the Big Room can also be converted into a Dolby-certified film-mixing stage, where projects including Quantum Of Solace, Brideshead Revisited and The Number One Ladies’ Detective Agency have taken shape. 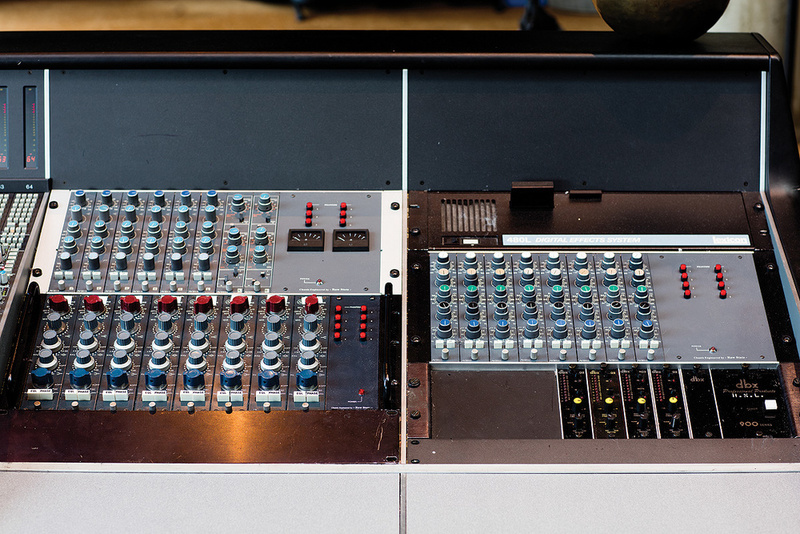 For this purpose, the large SSL can be temporarily swapped with a 32-fader D-Control console on a system of custom-made rails!